Brr! It's getting chilly here, and our first snowfall just cleared in time for the second one tonight. Know what that means? Well, it doesn't mean we'll have a white Christmas (Vancouver rarely does). But it does mean it's officially hot chocolate season! 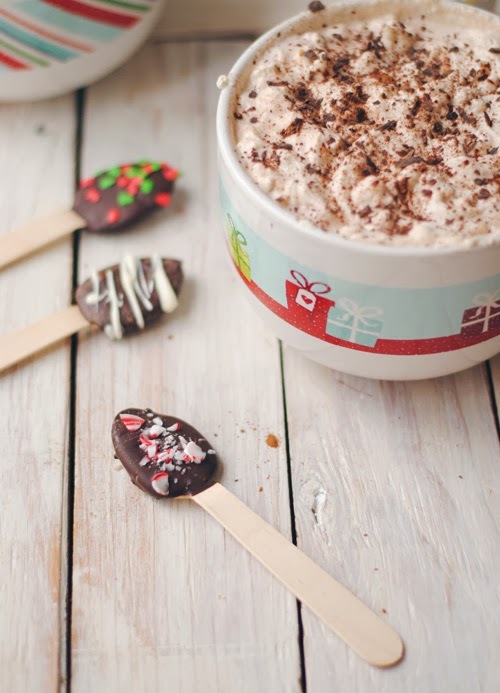 These hot chocolate spoons make the perfect decadent treat to dunk into a hot glass of milk to give it a little chocolatey boost, or to use to eat whipped cream off a creamy hot chocolate. Of course, my favourite way to eat them is in my morning coffee. Wrap them up for a gift or keep them for yourself! In a small bowl, melt the chocolate chips on half-power in the microwave. Check every 30 seconds, giving a quick stir, until they’re smooth. Dip the chocolate spoon in the melted chocolate, twirling until well covered. Place gently on a wire rack with parchment, wax paper, or foil beneath to catch drips. 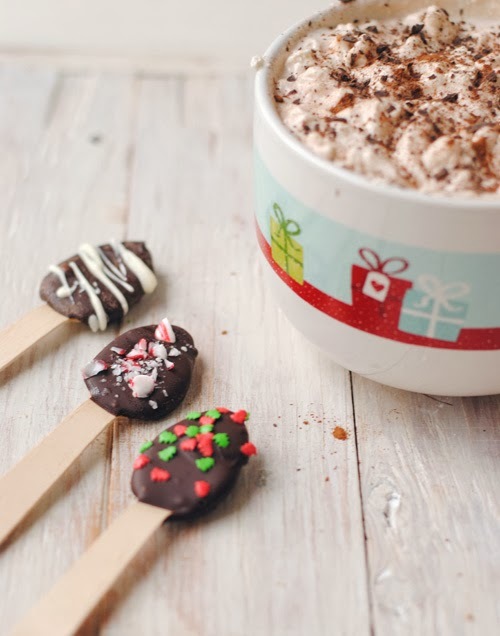 To decorate, drizzle with white chocolate, or gently shake on some sprinkles or marshmallows. Allow to cool completely, then use in your next coffee or hot chocolate!